8. 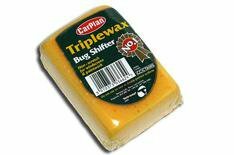 Triplewax Bug Shifter Pad | What Car? The rough side of the sponge looked like it would scratch paintwork, but fortunately it didn't. It did, however, cut through dried-on insects with only water. Does not buff to a shine without a spray and would be better used with a liquid remover for an effective cleaning combination. Cheapest product on test, but not widely available. Straightforward and relatively quick even, without a spray. Safe to use on all finishes and in dealing with a range of surface deposits.